With our practical knowledge of this automation, along with our expert technical partners, we can integrate a wide range of automated solutions to meet your requirements, whether this may be increasing productivity, improving quality, assuring safety requirements are met, legislative compliance, innovation, efficiency, and much more. Manufacturing robots can increase productivity dramatically. Higher rates of throughput yield higher profits. Manufacturing robots help produce products much faster than traditional manufacturing methods by decreasing part cycle times. The very nature of manufacturing robots lends itself to creating a leaner, more efficient manufacturing cycle, as well as improving the quality of the products due to their high repeatability and low re-working costs. The ability to operate safely in often unsafe & hazardous environments. 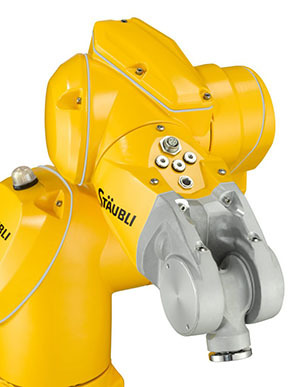 With having a high level of understanding in this field with both Fanuc and Staubli robotics, we are well positioned to provide a tailor-made solution to maximise your productivity & minimise downtime. Robot arm controller providing the operator with complete manufacturing cell control. Increasing quality requirements and falling prices have led to production processes being optimised and components being checked, preferably by 100%, while the production speeds rise. Machine Vision & industrial code reading systems are able to give these quality improvements to any manufacturing process, enabling products to be made at higher speed, without defects and at lower cost. We have the ability to integrate these manufacturing process requirements within our solution which typically fall into 2 distinct categories, namely Code Reading and Feature or Shape detection. 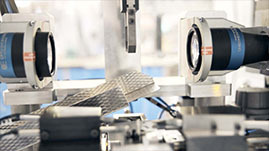 An end of process vision system verifying the dimensional accuracy of components. Certain customer in-process quality requirements involve the need to be able to detect whether a specific feature is either present or not present on a component during the manufacturing cycle. In reality this may present itself in the form of detecting whether a screw thread is present on the component prior to being ground or, in more sophisticated systems, that the part is actually to the correct final dimensional specification as required from engineering. 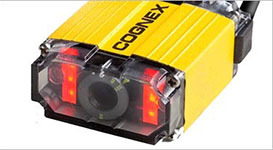 A camera for use with Data Matrix Code reading. Optical Character Recognition and Data Matrix are two techniques by which products or components can be identified by a vision system, and are known as automatic identification methods. 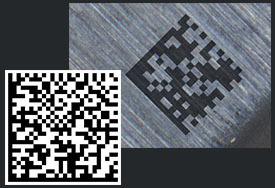 DataMatrix are visual codes that can be read and decoded by machine vision systems. By working closely with our preferred suppliers, we are able to design and optimise the vision system that is best suited to the customers’ specific requirements. 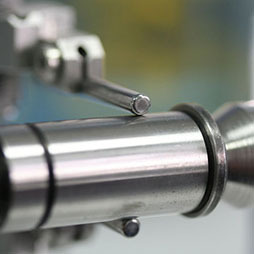 In-process measurement control systems are used in our cylindrical grinding machines to measure workpieces in real time during the production process. The control systems operate with high precision, reliability and repetitive accuracy. They continuously check the quality of your components, thereby ensuring that your production process consistently produces high quality output. To ensure process reliability, in-process measurement control systems automatically compensate for any tolerance variations, which can arise, for example, when grinding discs become worn or as a result of temperature fluctuations. In such cases, the inprocess control systems monitor the measured values in real time, thus controlling the grinding process continuously until the nominal dimension has been reached. This process helps to minimize part rejection and unnecessary rework. The measuring heads can also be equipped with an optional crash protection system, which prevents impact damage to the measuring system and workpiece, preventing unwanted downtime. Have a look at the video below showing in-process gauging of a turbocharger rotor. Curtis Machines are fitted with Sinumerik 840D SL, Sinamics S120 drives and Simotics motors. SINUMERIK 840D sl is considered to be the standard in premium class CNC, which is certainly justified. 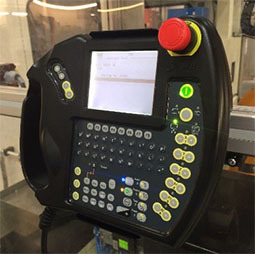 Maximum CNC performance, along with a degree of flexibility and openness that has not been able to be achieved until now, are the basis for almost any CNC machine. The SINUMERIK 840D sl offers an almost inexhaustible performance potential – thanks to its drive-based, highperformance NCUs (Numerical Control Units) with stateofthe-art multicore processor technology. This means that up to 93 axes in 30 machining channels can be controlled in the NCU link. Machine tools with fewer axes benefit from the performance of the SINUMERIK 840D sl as a result of the highest degree of machining precision with the shortest machining times. Using PROFINET, the leading Industrial Ethernet standard, the SINUMERIK 840D sl is perfectly embedded in the Siemens Totally Integreted Automation (TIA) environment. TIA stands for a unique level of integration – from the field through the production, up to the company supervisory level. The result – every component within the automation solution optimally interacts with one another. This allows you to achieve maximum transparency and availability of the production process. Siemens Machine Tool Systems is the leader when it comes to protecting personnel and machines. For almost two decades now, SINUMERIK Safety Integrated has been setting the benchmark for machine tool safety technology. Here, intelligent system functions permit user-friendly operation of the machine – for example, machines can be set up with the protective doors open. This provides the highest degree of safety for machine operators and the machine itself. outstanding drive solutions for machine tools. SINAMICS S120 is synonymous with performance and flexibility when it comes to equipping machine tools. In addition to a wide range of motor modules, there is also an infeed unit with a controlled DC link. This ensures the shortest spindle acceleration times and facilitates perfect reactive power compensation for the complete machine (cos φ = 1). 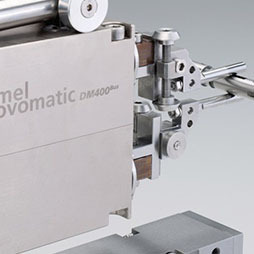 This is complemented by DSC (Dynamic Servo Control), which represents a unique position control technique to achieve the highest dynamic performance of feed and spindle motors. protection, strong bearings and rugged design mean that these synchronous servomotors have outstanding reliability. High-quality magnetic materials result in a very high power density – and therefore very small motor dimensions. This allows these motors to be installed in extremely tight spaces.